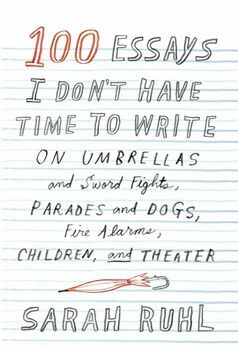 “Don’t send your characters to reform school!” pleads Sarah Ruhl in one of her essays. With titles as varied as “On Lice” to “On Sleeping in Theatres” and “Motherhood and Stools (The Furniture Kind),” these essays are artful meditations on life in the arts and joyous jumbles of observations on everything in between. The pieces combine admonition, celebration, inquiry, jokes, assignments, entreaties, prayers, and advice: honest reflections distilled from years of working in the theatre. They offer candid accounts of what it is like to be a mother and an artist, along with descriptions of how Ruhl’s children’s dreams, jokes, and songs work themselves into her writing. 100 Essays is not just a book about the theatre. It is a map of a very particular artistic sensibility and a guide for anyone who has chosen an artist’s life. One hundred incisive, idiosyncratic essays on life and theatre from a major American playwright.